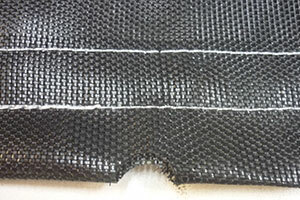 For 50 years, Topline has been making all sizes of black poly mesh rectangle trampoline mats. 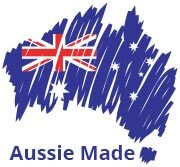 Our replacement mats are Australian Made and designed right here in our Gold Coast factory. 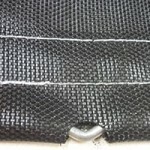 You can rest assured that your rectangle trampoline mat will be made with quality and precision. Aussie mats use the wire bar system so if your old mat has the wires inside, you can re-use them. If you are missing some buy pack of 10 as spare parts. Or if your old mat has Chinese triangle attachments, it means you need to buy our mat with a full set of wires. Click here for measurement instructions, and contact us if you need guidance. This table below is sorted by # of Mat Attachments… up one long side… across one end. Springs not included, sold in packs of 10 in the spare parts section. If you do not see your mat on our list, we also specialise in custom-made black mats, please post us your old mat.